I’ve finally hit my stride a little with the whole Christmas present thing. This weekend I got out the sewing machine to make another adorable and ridiculously easy baby blanket from Last Minute Patchwork + Quilted Gifts. This is the 3rd one I’ve made this year, and I love how something so simple becomes unique and perfect with the right fabrics. This one is for our niece, Livi. She’ll be 2 in January, and she lives in London. I’ve had this Japanese Little Red Riding Hood fabric in my stash for a while; I can’t remember where I got it, but I’ve been saving it for the right project. This was the right project. I wanted something bold that she can just drag all around the house, so I used bright red fabric from my stash for the back. 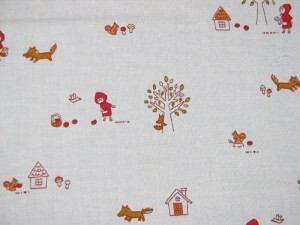 Then I stitched the quilting in white so it disappears on the front but pops right out on the back. I can’t explain how easy this is. 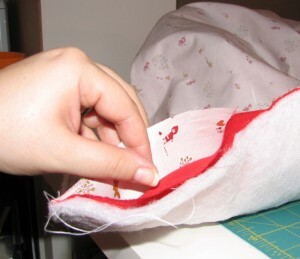 The directions in the book have more specific dimensions, but I basically used a yard of each fabric, stuck the batting in and cut the whole thing until it was squared up. 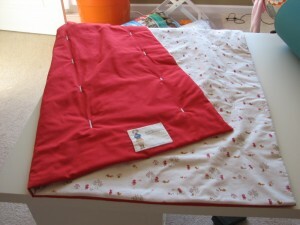 I made a quilt sandwich with the batting on the bottom, then the red fabric patch-side up, then the Red Riding Hood fabric print side down. I sewed all the way around, leaving the bottom right corner open. I turned it inside out, sewed the corner closed, pressed it, and did the white quilting stitch in a pattern along the fabric. It took a couple of hours tops. 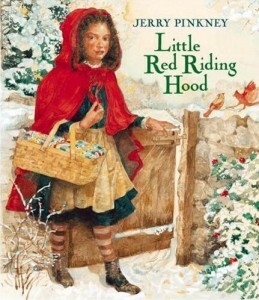 And I bought Jerry Pinkney’s criticially acclaimed Little Red Riding Hood to give with it.